Pi Day & Albert Einstein – every day's a holiday! “I am ashamed to tell you to how many places of figures I carried these computations, having no other business at the time”. I have to admit I’m a Pi holiday snob. 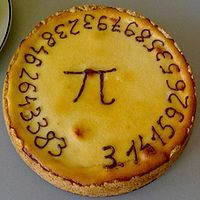 I don’t celebrate Pi Day on March 14; I prefer its more accurate European equivalent, Pi Approximation Day, celebrated on July 22 (22/7). It’s been said the only real Pi Day was March 14, 1592. (3.14 1592) and of course even that was only accurate to 7 digits. At that time, Pi wasn’t known as Pi but as “that funny circumference-over-the-diameter number that goes on forever and ever and ever, and I’ll stop calculating it as soon as I find the pattern.” Fortunately, Welsh mathematician William Jones shortened it to just ∏ in 1705. Pi was the first letter of the Greek words for periphery and perimeter. March 14 is not only easy to remember, it has the added bonus of being the birthday of Albert Einstein, born in 1879 in Ulm, Germany. At age 26, the clerk at a Swiss patent office unleashed three scientific papers on the world, the least of which would have assured his place in history. The greatest of which changed history. That was the Theory of Special Relativity, or the “Strangers on a Train Traveling Close to the Speed of Light” Theory. Either way, Einstein didn’t like the word “relativity” at all. He preferred “invariance theory,” referring to the consistent nature of light regardless of the motion and positions of its observers. Einstein next turned his attention to gravity. He spent much of the following decade aligning his theory of relativity with Newtonian physics. In 1915, he knocked it out of the park again, with his special relativity follow-up: the Theory of General Relativity. If ever a sequel was better than the original, this was it. Had Einstein not developed the Theory of Special Relativity in 1905, someone else would have. In a few years, maybe even a few months. But it’s been said that had there been no Einstein, had he not conceived of the Theory of General Relativity in 1915, the world would have waited generations to unlock it. General Relativity explained the inexplicable by affirming the impossible. That among other things, both light and time could (and must) bend in relation to mass. Einstein had comparatively little astronomical data to go on back in 1915. But this was a guy who managed to deduce Nobel-prize winning theories by observing pollen grains in water. One of Einstein’s clues was that the orbit of Mercury didn’t behave as Newton’s theory had predicted it would. Other physicists chalked this up to the possible existence of yet unobserved planetary bodies in our solar system. What Einstein proposed was the astrophysical equivalent of tearing down a house and rebuilding it because the door didn’t fit. He said that the way scientists since Newton had assumed the universe worked was fundamentally unsound. Even with his past successes, the theory was so out of conformity with the day’s scientific knowledge that Einstein could have been laughed off the world stage. But on May 29, 1919 the scientific community had an unprecedented opportunity to put an abstract theory as big as the universe to a visible, practical test. Astronomers predicted that on May 29, 1919, parts of South America and sub-Saharan Africa would experience an incredibly long 6-minute total solar eclipse, during which time the sun would be right in way of Earth’s view of the constellation Hyades. Scientist-adventurers led expeditions to remote areas of the southern continents to make precise astronomical records during the darkness of the eclipse. If Einstein was correct, the stars of the cluster Hyades would appear to shift from their normal positions because of gravity’s effect on the starlight as it passed by the Sun. The expeditions confirmed Einstein’s theory, and in the darkness of a 6-minute eclipse, the Newtonian world gave way to an Einsteinian one. For his contributions to science, Einstein deserves his own holiday for sure, even though he would be the first to forget it (He wasn’t good with birthdays) and the last to acknowledge any beneficial value in it. Darwin’s birthday, February 12, is shared with and often dominated by that of his contemporary Abraham Lincoln. Both men were born on February 12, 1809. And Isaac Newton’s birthday…well, it’s overshadowed just a teensy bit by a religious luminary named Jesus. Yep, Newton was born on Christmas Day, 1642 (OS). It’s fitting that we celebrate the two great pinnacles of physics on March 14 and December 25. In ancient Roman times, March 14 was the eve of the Ides of the March. The Roman political and agrarian calendar began on or around March 15 — when farmers planted crops and elected officials took office. And ended with the December festival known as Saturnalia, from December 17 to December 25. Newton’s birthday falls in the season of Christmas, Yalda, and Yule, which bid farewell to the old year and hello to longer days. And though they didn’t know it, our ancestors were really paying homage to gravity — the Sun’s pull on the Earth. Einstein’s birthday meanwhile comes amid spring festivals like Holi, Nowruz, Purim, and Easter, which celebrate rebirth and the circle of life, as well as the life-giving power of sunlight. What can we say? The guy knew his ∏. — Institutes of Theology from the Post-humous Works of Rev. Thomas Chalmers (1849) by Chalmers and his son-in-law biographer William Hanna. A half-century later, Alexander Whyte retells how Chalmers explained the concept to students in Skirling, Scotland. Now I just want pie. You should make an American Pi Pie, with savory “forbidden fruit of knowledge” filling and surrounded by a crust of circumambient darkness. Me and my friends in Europe actually celebrate it on 14 March! And it’s closer to the Lent-Festival period, so the need of a pie is there. This needs more info about how E. contributed to Pi Day. i love all these science-y holidays, am going to start celebrating them all with my kids. Mole day is the best! Geometers will easily comprehend that this new concept of Pi simply substitutes one ratio (ASR) for another (Pi) … and both ratios include the mysterious and stimulating essence of irrationality! Such is the nature of squared circles! However, the ASR perspective offers intuitive geometry for conceptualizing new solutions to “squaring the circle”. Pi Day 2014 presents an excellent opportunity to instruct Pi aficionados about the Pi ratio and how this same ratio can be represented as a cosine angle. As for Pi Approximation Day 2013, there will always be old Pi to feast upon.